I have always known this type bus as the Odorkor bus and it is pretty easy to understand why and how it is got that name. I will try to answer the why and how that name in no particular order and discuss if they are still relevant on the road. You only find these buses stationed in Odorkor and ply only the Odorkor to Kaneshie and Odorkor to Kwame Nkrumah Circle routes. They are so specialized/predictable that you can jump on any one of them without thinking twice if your destination is anywhere between Circle/Kaneshie to Odorkor. What you’ll find interesting about these buses is the fact that they’re never stopped by the police or MTTU (motor traffic and transport unit). Chances are you’re likely to find them ‘stopped’ by a mechanical fault than a police and if you have ever ridden on one you will wonder how they renew their road worthiness certificates. You can call them the most deadbeat buses in Accra or Ghana, save for the Korle Gonno bus (for another blog post) or the occasional village bus driven and maintained by the same person; its driver and mechanic. Now to answer the why part; why Odorkor-bus? Because no one can be bothered to remember or pronounce or call them by their right names; the Willowbrook bus! You’ll occasionally find the name Willowbrook on the back or front of one of the Odorkor buses as proof of their brand name but count yourself lucky if the driver of same bus understands that you’re referring to his bus when you mention Willowbrook. Another Ghanaian moment! No love for long, tongue-twisting English words here!! No sir. Did you know they are also called Space Buses? A name that represents the spacious alleys in these kind of buses than anything else. I hope this info makes it into the Hitchhikers’ Guide to the Galaxy! One thing I ask myself when I see them on the road is; are these buses still relevant? And sadly, I always come to the same one answer, Yes-and-No. Who am I to determine that? I am just a spectator and I think I can put forward an observation. 1. These buses are run like any government run public transport system; people are allowed to stand in them, so they carry lots of passengers during rush-hour. 2. They make so many stops between Odorkor and Kaneshie/Circle that there is no [long stretch of road] over-speeding. 3. They are less likely to be involved in accidents mainly because of Point 2 above and also because they have very weak engines which cannot top 100km/h as a general rule. 1. These buses are the most unsightly to ply some of the busiest routes in the capital; they definitely take away from the beauty of Accra. 2. These buses smoke the most and pose the most health hazard to passengers and other road users. 3.They slow down traffic considerably because they stop at every conceivable junction and travel at very slow speeds. Whiles they are most likely to have poor lights, no working wipers and bad brakes it still confounds me how they have road worthy certificates. 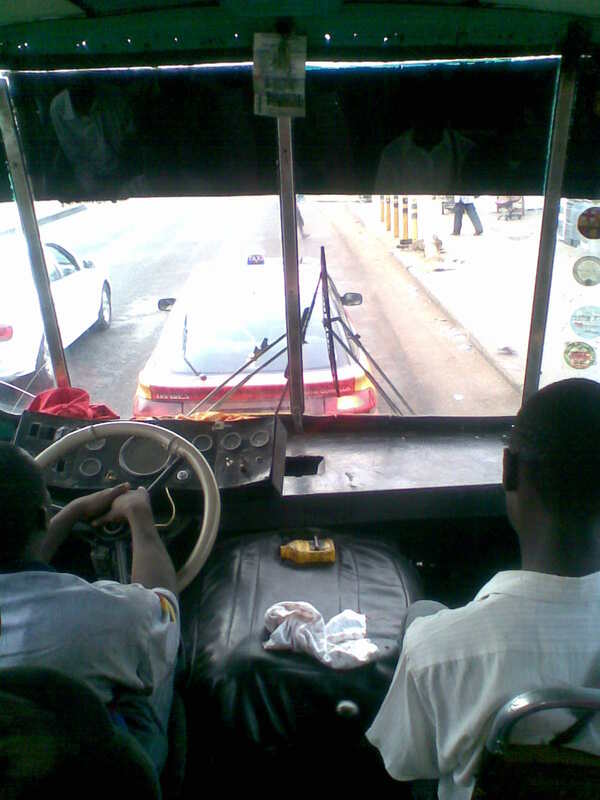 Can the government or private sector invest in better, safer buses that will replace these Odorkor buses? Maybe that is all they are waiting for; a new generation of better and safer public transport buses to continue the tradition that Willowbrook buses have maintained all these years. Till then, whenever I hear the mate of an Odorkor bus shout for passengers, all I hear is ‘passenger beware’. I’m sure some of you have seen this song? (music video) or a similar one on Crystal? TV and I’m certain most of you cannot even remember the chorus to the song. I like innovation, heck, I like (doing) new things…but the NEW!! trend of advertising Ghanaian movies by releasing a music video is a sorry attempt at selling or marketing. These music videos are poorly written, poorly sang, poorly directed and poorly produced. They simply reek of poor quality and they are flooding our TV sets and wasting our precious family times behind the set. Bad songs like these do not deserve the attention or airtime they get, no wonder they never make it onto any nomination or awards list. Methinks these songs do not represent Ghana’s rich musical culture!! Whose (burnt) car is this? And who moves it? I’m sure every car has an owner, the premium paying person who will suffer loss if the car is involved in some accident. But what happens if the car gets burnt? And what if the insurance cover is the minimum(3rd party insurance) that does not cover fire, theft etc. 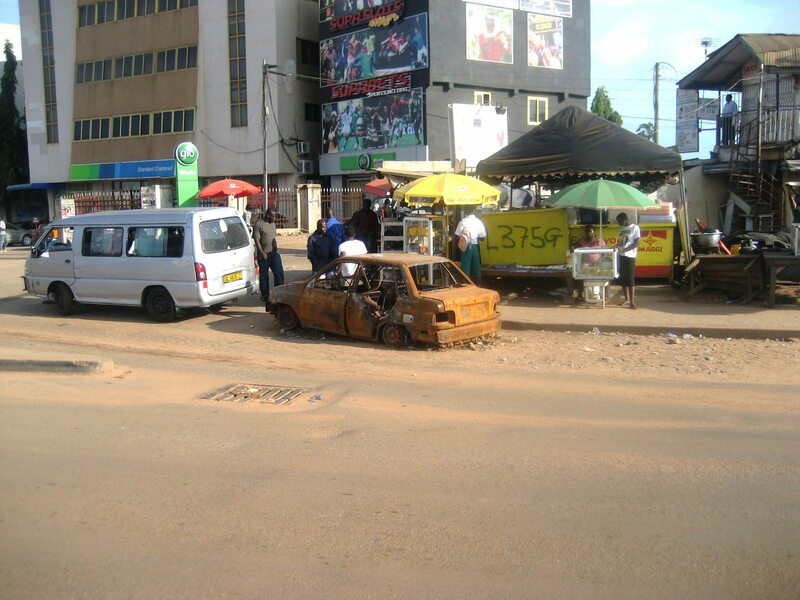 Whose responsibility is it to move this burnt car? 1.The (former) owner who cannot make an insurance claim for a replacement and effectively doesn’t own a car? 2. The Accra Metropolitan Assembly (AMA), whose duty it is to keep Accra clean? 3. Motor Transport and Traffic Union (MTTU) who make sure motor traffic is safe on our roads? 4. Ghana Police who make sure law and order is maintained? Just go have a look-see at this burnt car at Abeka Lapaz, Accra. It has done a week now, I’m sure you might find it next week, until hopefully a scrap dealer does everyone a favour (saves us from possible accidents, excessive traffic jams) and tows it off.